I have spent most of my 46 years running from the thoughts in my head, seizing on interruptions as a merciful distraction to the noise. My vow of low-tech living is driven more by poverty than lack of interest. I've used working in the news business, jogging, partying, meds, talk therapy and yoga to temper my racing mind. But I have never tried meditation because I fear it. I think sitting still with my thoughts for more than a few problem-solving minutes, lingering too long, will mean ruminating, and rumination leads me in two directions—depression or inertia, unless I am actively inert on a beach, climbing a mountain or splashing in an ocean. The idea of spending time in stillness seems contrary to inspiration to me, and yet, the concept of unplugging is hotter than ever, with chichi hotels offering to take thousands of your dollars to make sure your room lacks Internet, phone or television. And, science is showing that such locking down of our communication is essential to survival in this fast-paced, take-no-prisoners world. Even trying to consider slowing down seems to have an unspoken urgency to it. But many learned folk have long taken the time to consider these things, in the quiet of their stolen moments, and have determined that they can benefit all those things we are rushing to catch up with. It can make us more organized, thoughtful, productive and, dare we believe, happy? It was in 2008, while reading the 13th-century poet Rumi's precept that "what nine months does for the embryo, 40 early mornings will do for your growing awareness," that Valerie Skoni of Ketchum decided to help herself, and anyone else who was interested, to partake in a daily practice of stillness, together. "People are looking for stillness, they are looking for inner peace," she said. "It's easier for most people to do something and stick to it when they have a group to do it with." commit 40 minutes over a period of 40 days to intentional stillness. Skoni said that through word of mouth and networking, and thanks to celebrity converts to the concept of meditation by mega-active Oprah Winfrey, the local chapter has gone worldwide, with more than 20,000 people in 30 countries joining in the 40-day "feast," which runs from Jan. 15 through Feb. 23 this year. celebrating unprecedented traffic to its online meditation site, which is available in four languages and broken down to accommodate all ages. There will be numerous sites for daily reflection in Ketchum and Hailey throughout the event, as well as some special events and the addition of daily acts of kindness as a spiritual practice. Some simple ideas include complimenting someone, forgiving someone, giving up your place in line, surprising someone with a shoveled walkway or sending a greeting card through www.gratefulness.org, to name a few. "Dedicated spiritual practitioners know that Acts of Kindness to oneself and others flow naturally out of daily practice," reads the explanation in the event's brochure. "In these most difficult times, being engaged in community through Acts of Kindness could have a significant impact on the lives of people throughout the world." Though all of this is considered a spiritual practice, Skonie assures that there is no religious aspect to the event, and that all religions are welcome. "What impresses me most is the caliber of gifted people who keep showing up to move this thing forward," Cody said. The group is nonprofit, relying solely on volunteers and donations to perpetuate, but word of mouth backed up by a new brochure has seen the concept extended to schools and prisons, where teachers and wardens, students and inmates are learning the power of settling their minds, even for a few moments. Based on an inquiry of two young German children, Skonie has added the "Four Minutes of Stillness for Children." Sounds like something that even I can give a whirl. 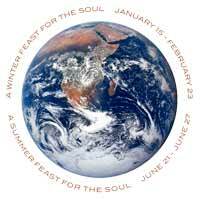 For more details, visit www.winterfeastforthesoul.com. - A free daylong meditation retreat, Saturday, Jan. 7, at Light on the Mountains Spiritual Center south of Ketchum, 8 a.m. to 3:45 p.m.
- Evening of Rumi Poetry, Tuesday, Jan. 10, at a private home in Hailey. - Opening Ceremony, Sunday, Jan. 15, at Light on the Mountains Spiritual Center. In Ketchum, 8:15-9 a.m. Monday through Thursday at St. Thomas Episcopal Church, and Fridays at Diane Crist's office, 171 First St., Ste. 1. And daily from 12:15-1 p.m. at St. Luke's hospital in the chapel. In Hailey, Monday through Friday, 8:15-9 a.m. at the Sun Club, 731 First Ave. N. and 12:15-1 p.m. at Maha Shakti Yoga Center, 416 S. Main St.
- Meditation and Oneness Blessings nightly at 6:15 p.m. at Light on the Mountains Spiritual Center. - Closing ceremony, Thursday, Feb. 23, at 7 p.m. at St. Thomas Episcopal Church. For details, call Rosemary Cody at 720-7530 or visit www.winterfeastforthesoul.com.